A Democratic Response to the Crisis – Sept 29th, 2001. * Over 70 participants representing 19 state Green parties turned out on less than a week’s notice to participate in the Green Party’s Saturday, September 29th, emergency organizing conference at the University of the District of Columbia campus in Washington D.C.
* States and colonies represented included California, Arizona, Texas, Louisiana, Tennessee, Minnesota, Wisconsin, Illinois, Michigan, Ohio, Pennsylvania, New York, New Jersey, Washington D.C, Maryland, Massachusetts, Kansas, Virginia, and Georgia. 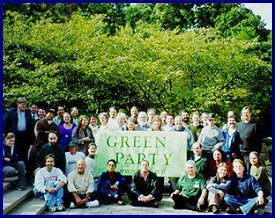 * Thanks to Gail Dixon, Steve Shaferman, Erik Gustafson, George Ripley, and the D.C. Statehood Green Party for hosting the conference! * Kit Gage – National Coalition to Protect Political Freedom – http://www.secretevidence.com – Status of efforts to defeat so-called “anti-terrorism” legislation in Congress and to protect political freedom in the U.S.
C) Workgroup Breakout Reports – Conference participants broke into four workgroups to discuss future organizing in the context of the current political crisis. Thanks to Susan Metz for taking notes. * Coalition Building – General discussion: Need to look for unlikely allies (e.g., Cato Institute); do your homework to find out what messages your potential partners are likely to spread; be sure that you are “seen being Green” and are identified as a Green whenever appropriate; assert your “Green” message outside of the coalition as well as within it; ensure that Greens are represented on any public platforms; make use of Green perspectives to dig into deeper and broader issues; be sensitive to support and participate in leadership, and not to exploit. * Direct Action – Can enhance or complicate electoral politics; need to continue use of direct action especially now, to remain visible and expand democracy; possibility of shutting down shareholder meetings to protest crisis profiteering; protest exclusion from debates, establish our own debates, in coming elections; use of theater and ability to act spontaneously and/or quickly both still valuable; develop programs for community self-protection in place of police; consider bringing “witness” idea to new level – attempt direct engagement with other people to focus on emotional and compassionate response to crisis (i.e. – going into cafe’s, bars, libraries, other public spaces with purpose of engaging public in a compassionate way). I want to talk about the problem of talking about the problem. We are doing something difficult, something that many wish we were not doing at all. “Life is at the start a chaos in which one is lost,” wrote José Ortega y Gasset: “The individual suspects this, but he is frightened at finding himself face to face with this terrible reality, and tries to cover it over with a curtain of fantasy, where everything is clear. It does not worry him that his ‘ideas’ are not true, he uses them as trenches for the defense of his existence, as scarecrows to frighten away reality. We are taking away people’s scarecrows at a time when they are deeply wanting them. We can not eliminate the tension this involves but we can perhaps mitigate it and make it work more to the advantage of peace and justice. How, for example, do we discuss this issue? In the manner of a debate? With the fervor of a true believer? In anger? With a data dump of facts and arguments? These aren’t the only alternatives. There is the probing and the prodding of the teacher, raising a question here, a doubt there, and skepticism along the way. There is the quiet witness which when pressed says something like: my faith teaches me that we must find answers outside of anger and violence. There are the examples from history – best of all American or military history. I sometimes remind people that we haven’t won a war since World War II, unless you count Granada. A simple fact like this can alter the tone of the conversation. We pledge allegiance to the republic for which America stands and not to its empire for which it is now suffering. Why does the media always refer to people defending our civil liberties and the Constitution as “activists” or “advocates?” Wouldn’t “citizens” do just as well? The World Trade Center disaster is a globalized version of the Columbine High School disaster. When you bully people long enough they are going to strike back. Some day our leaders may again be as good as our firefighters.